Journey of a Lifetime with Shaykh Faisal! ROUND TRIP AIRFARE : TORONTO – JEDDAH – TORONTO. ACCOMMODATION IN MAKKAH ( TWO,THREE OR FOUR PERSONS PER ROOM ) WITH BREAKFAST AND DINNER. HILTON TOWERS HOTEL – NEAR TO HARAM. ACCOMMODATION IN MINA & ARAFAT IN TENTS WITH MEALS AND COLD DRINKS PROVIDED. ACCOMMODATION IN MADINAH WITH BREAKFAST AND DINNER (OPEN BUFFET). TWO, THREE OR FOUR PERSONS PER ROOM. DALLAH TAIBA HOTEL – NEAR TO HARAM. GUIDED VISITS TO THE HOLY SITES AND HISTORICAL ATTRACTIONS. ALL TRANSPORTATION IN SAUDI ARABIA BY AIR CONDITIONED BUSES. THE GROUP IS ACCOMPANIED BY EXPERIENCED GUIDES AND QUALIFIED SHEIKHS. HAJJ SEMINAR (INFORMATION SESSIONS) WILL BE ARRANGED. ASSISTANCE FOR OBTAINING VISA AND IMMUNIZATION WILL BE PROVIDED. HAJJ TAX AND COST OF QURBANI NOT INCLUDED IN THE PACKAGE. MAKE YOUR RESERVATION NOW ! SEATS ARE LIMITED ! A NON REFUNDABLE DEPOSIT OF $2,000.00 MUST BE PAID WITH REGISTRATION. 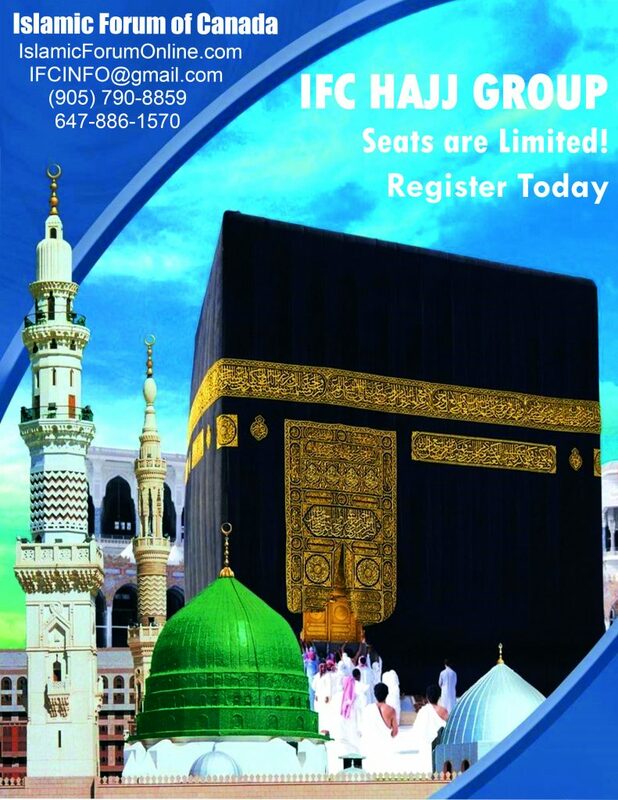 CALL NOW TO JOIN THE IFC HAJJ CARAVAN.